I am writing from a cave of an internet cafe that sits in the alley across from the Institute. It is now day two of QUILTED and already many things have occurred and changes are being made in how the project will proceed. Yesterday, there were six participants: myself, Teresa from Chile and the Workcenter, Jessica from France and the Workcenter, Anya from Poland, Alicja (pronounced Alizia) from Poland and Iva from Bulgaria. Today, it was just me sewing, but I have a feeling QUILTED will now continue throughout the festival and there are two possibilities for me to join sewing circles here in the community outside of the festival. This is a terribly short post with little information, but it is an update from the front and I'm late for lunch, which is NOT a good thing. More later...and photos too! I had high hopes of being able to write almost daily about the progress of QUILTED, but it turns out I'm much too busy here in Wroclaw to find time to sit down and write while also near an internet connection. I've found just such a moment, but must leave very soon to attend a performance of the Open Program (of the Workcenter of Jerzy Grotowski and Thomas Richards) at an ancient bar here in town called Kalambur. I've been doing all sorts of small work in preparation for QUILTED, which begins this Thursday morning (I've been thinking it was FRIDAY!) at 10am. The above photo is of the first store I went in to to inquire about sewing communities in the area. The owners are Irish and the woman who spoke with me was very helpful though she said she herself much prefers drinking beer and watching Football to sewing. In any case, she gave me the number of a group of women who get together to sew and crochet. We've since contacted these women (they don't speak English so I've enlisted the help of a Polish friend) and it is possible they will participate. If you google "quilting bee" you may become as disappointed as I did to learn that there really isn't much accurate historical information on the Internet. I've even gone in search of articles in the UW library's online database and found very little in the way of written accounts of quilting bees. Even more difficult to find are photographs (or drawings, paintings for that matter) of quilting bees in action. 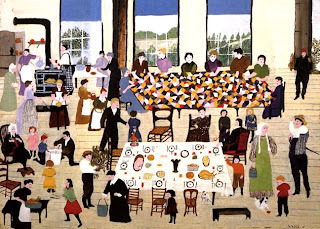 So, here is the first installment in a list of inspirational elements: The Quilting Bee by Grandma Moses (1950). In tandem with this project, I hope to find more artifacts and historical accounts. I would like to propose a quilting bee for Zero Budget Festival. A quilt is a blanket made up of small fragments of cloth. The fragments are carefully designed and hand-sewn individually. The quilt is then pieced together and hand-sewn by a group of women during a quilting bee. 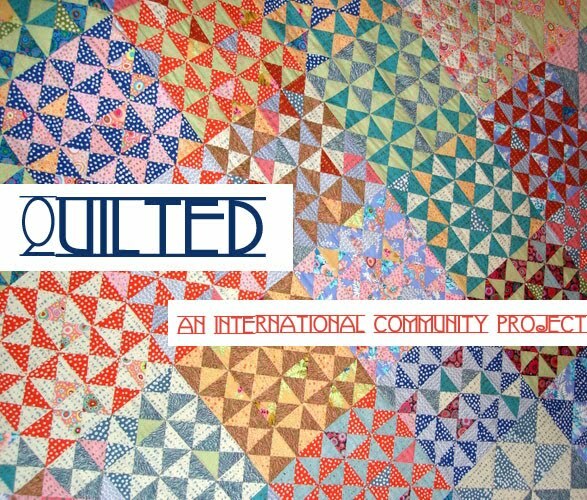 Historically in the United States, women would gather at quilting bees to sew the fragments together, creating patterns and texture through this assembly, with the end result being a functional while wholly unique quilt. Quilting bees originated as a custom to help prepare a young woman prior to her wedding. The older married women of a community would gather to help the young woman build a collection of summer and winter quilts for her marriage. During these bees, younger women would learn a variety of skills from the elder women of the community. The gatherings were also an opportunity for friends that lived far apart to meet, socialize and reconnect. Quilting bees were solely attended by women, and three, four or five generations could be found under one roof. These gatherings were a rite of passage and a way in which a young woman could learn from the elder women of her community, not just her family. But with the advent of technology and the changing state of communities and social networks toward all things modern, quilting bees have ceased to exist. As the first decade of the 21st century comes to a close, it is clear that there is no current equivalent for this kind of multi-generational female community. However, a need certainly persists, and perhaps now something else is possible. Zero Budget Festival strives to understand art as a way of interacting with others in a world increasingly fragmented and segmented by technologies that speed up the pace of life and place the members of a community at a distance from one another. Quilting bees necessarily move at a slower pace. While women often accomplished much in one day, it was a day spent together, as a group. Today, quilting bees are essentially an historical relic in the United States. The time and effort involved in the hand-sewing of several quilts can be contracted by the purchase of factory-made blankets. Yet while time might be preserved, that which binds the women of a community is lost. The act of community-making is lost. The process of educating the next generation of women is lost. The Zero Budget Festival quilting bee will be an experiment in creating a temporary international and multi-generational community of women. Can the essence of an older generation’s knowledge of what it means to be a woman be transferred during such a short period of time? If so, how does this transfer occur? The international aspect of the participants immediately discounts language as a primary method of transfer. Within this potential conflict lies the true opportunity of the quilting bee: the transfer not only of skills, but also the essence of something inherent, though gained through time and experience, the passing down of which cannot be done through verbal communication. This experiment redefines the nature of its starting point for it adds a larger scale to the original form of the quilting bee and challenges each participant to work and interact in a different way. And within this challenge lies the true potential of how one might respond to Zero Budget Festival’s questions about community and (inter)action. Zero Budget Festival seeks new modes for understanding community within the framework of creative interaction. The quilting bee will give its participants a chance to develop a mini-community over two sessions. 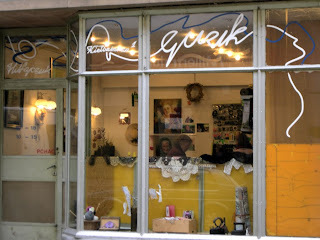 Older participants, led by an experienced seamstress living near Wroclaw, will have the opportunity to offer guidance. Younger participants will learn how to piece together their individually-created fabric fragments into a larger, unified quilt. The design and theme of the quilt will not be discussed directly. Instead, these aspects will evolve through the shared development of the participants; the skilled and unskilled playing equal parts in this evolution. Observing and possibly redefining the feminine rite of passage in an international context is primarily the intention of this proposal. Additionally, the fragmentation of society caused by Globalization is a secondary point which can be addressed through the quilting bee. Technology has paved the way for ease of mass production which has practically eliminated the existence of community-oriented trading of skills meant to support and bolster the community as a whole. Community bonds are fragmented. The beauty of the quilting bee is that it instead takes the fragments created and brought together by the individual members and binds them together into a single object with purpose, touched and marked by the community that created it. The irony of Globalization is clearly lost on its greatest advocates: a concept that theoretically brings nations closer together and into working partnerships actually destroys the fabric of communities that truly work together. In global mergers it is only the highest members of government and CEOs of major corporations that are working in a partnership together. The Zero Budget Festival quilting bee can take the word “Globalization” back from those that wish to simplify the world into a mass-production market. 1. The proposed event is a quilting bee, but it must be divided into two sessions. During session one, the members of the bee will meet one another and begin and complete the fabrication of their individual fragments. Participants will each bring a piece of fabric and I will also provide some bits of fabric so that participants can manipulate their individual fragments. Members of the group will be encouraged to share, trade and transform their fragments into something new. The result of session one will be the individual fragments that will later be made into the quilt during session two. Session one should occur within the first few days of the festival and should be two to three hours in duration. Session two should occur toward the end of the festival, yet a few days prior to the completion of the festival so that the quilt can be finished if it remains unfinished at the end of session two. 2. The number of participants depends. Currently, it is hoped that a master seamstress living near Wroclaw will take the role of director (i.e. will be responsible for showing participants how to sew their individual fragments and will oversee the sewing of the final quilt). A woman has been contacted who is interested and she also has twenty or so women who work with her. Either all or a fraction of these women could comprise the elder participants and members of the Workcenter who might be interested in participating can also join in. If there is a great deal of interest, multiple quilts could be the result of session two. Once the proposal is accepted, the second step would be to contact all women currently participating in the festival to determine a list of participants. 3. Venue size will depend on the final number of participants. However, the type of venue that would most suit a quilting bee is a large room with lots of seating and tables that can be easily moved. Quilting generally occurs around a table, but sometimes it is easier to work in a circle of seated women without a table in the center. The tables will also be used to display fabric during session one and for laying out food and drink during both sessions. Good lighting is also preferable. Once the participation list is finalized, a better estimation of venue size will be available. 4. Currently this proposal involves a Plan A and a Plan B. In Plan A, this project is spearheaded and organized by myself, but the actual bee would be directed by a seamstress from Poland. Historically, quilting bees were planned and directed by the oldest women in the family of a young woman about to be married. The peers of these elders would share in the direction and the younger participants watched, listened and learned. Because this is an international and multi-generational experiment, the preferred mode of running the bee would be through the guidance of an elder Polish woman. With the help of Aga from the Downstairs Group of the Workcenter, I am in contact with an elder Polish seamstress who is interested in the project. If for some reason she cannot participate or cannot help us find a peer who can participate, I am willing to lead the project under the guise of Plan B. All aspects and questions would remain the same in this second ideation of the experiment, however certainly new questions and imaginings would arise. Because Plan A is the preferred method, I continue to work to find the women that can help it come about. Should this not be possible, I am committed to seeing Plan B fulfilled with some minor adjustments that will need more consideration. 5. There is the question of what should be done with the quilts upon completion. I think a showing of the quilts would be suitable as long as the showing is creatively thought out. This might be one of the discussions to be had with the Polish participants. It also might be fruitful to make a gift of the quilts, but this is a question that also needs further consideration. Along these lines, there is the question of the name of this event. Although quilting bee is suitable and to the point, this experiment seeks to see what kind of bee is possible when the element of verbal communication is removed or at least reduced considerably. For this reason, more thought must go in to what this event should (could) be called. For the moment, it is a quilting bee. Thank you for your time and consideration in advance. If it is a suitable fit, I look forward to bringing this experiment to the Zero Budget Festival. Hello faithful readers (Aunt Louise and Mom)! This is a semi-professional (read VERY semi) journal of the days leading up to what will be a very interesting international community project...if I do my homework...which I certainly plan to do. I am currently in Wroclaw, Poland, where I am helping with a number of various projects and daily tasks (babysitting included) for the next month, but in approximately two weeks, one of the main reasons for my being here will begin: Zero Budget Festival. ZBF is being put on by the Workcenter of Jerzy Grotowski and Thomas Richards as well as hosted by the Grotowski Institute. If this is all Polish to you, don't worry...I plan to explain myself in much more detail in the coming days. How I got to this point is a long, lovely story (in my mind at least) but all that you truly need to know to understand what this blog will be about is this: I was sent a call for proposals by a member of the Workcenter (also known as Lloyd) and I submitted one and now I find myself working to prepare for QUILTED, which is the name of my project and has a more official subtitle that I cannot at the moment quite remember. Because I only decided to create a blog about this project an hour ago and because I am using the Internet in my roommate's room, I will leave you for now...but I wanted to post SOMETHING, and here it is. I think I'll go ahead and post the proposal and try to make sense at a later date.